Apple Teacher is a free professional learning programme designed to support and celebrate educators using Apple products for teaching and learning. As an educator, you can build skills on iPad that directly apply to activities with your students, earn recognition for the new things you learn, and be rewarded for the great work you do every day. You’ll be able to add the professional learning hours to your GTCS update and gain confidence in unleashing the creative potential built in to the iPad. When you sign up for Apple Teacher, you’ll start a self‑paced journey through the Apple Teacher Learning Center and Multi-Touch starter guides for iPad. The programme is open to all educators and is a great way for schools and education authorities to offer free professional learning that their staff can work through together. Whether you’re new to Apple products or have been using them for years, whether you have a single device or one for every student — Apple Teacher has the tools you need to use iPad to connect with all learners. Perth & Kinross will be running a series of bootcamp sessions to get you started on the path to greatness. Check out the CPD page to find out when the next session is. If your school is interested in the program, our Regional Training Centre manager can arrange a bootcamp session just for your team. The National Digital Learning Week runs from 15-19 May with the theme of #DigitalDifference. Across Perth and Kinross Council(PKC) and nationally throughout the week, you’ll see people sharing and celebrating the digital approaches which make a positive impact on classroom practice. PKC will be sharing case studies on the small and sometime big steps individual teachers and schools make on their journey with digital learning and teaching tools. If you are a teacher or school in PKC and would like to share what you have been doing then you can use your website or twitter or your other social media channels to share that with the world. If you add the hashtag #DigitalDifference and tag @PKCEducation into your posts we’ll be able to capture the wide range of activity going on across Perth and Kinross. Often we get hold of a pdf that you would just like to fill in, rather than print out, fill in and then scan and email. Too much of a faff to be honest. 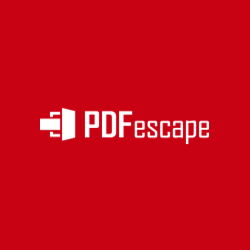 PDFEscape is a site that allows you to upload a pdf and draw form fields in the places you would like to write in. Simply then save the file and you will have created an editable PDF that other can fill in, save and return to you. This year the theme will be “Digital Difference” and we’ll be able to celebrate the kind of work we do with children where digital technologies have made all the difference to their learning be it in terms of engagement, progress, understanding and pupils being able to demonstrate their leaning in ways relevant and meaningful to them. Email me here to talk about how we could best share your work. More details of the day will be updated here and on the National SIte. Free apps from Duck Duck Moose! Unbelievably the excellent apps developed by Duck Duck Moose for Early years pupils are now all free on iPad. There are loads of favourites here, from Chatterpix to Draw and Tell, these apps should add extra depth for your learners. Have a play yourself, they are great fun. The new National Digital Learning and Teaching Strategy was launched during the Scottish Learning Festival last week which, having spent a considerable amount of time consulting young people, schools and other stakeholder, outline four objectives which together will transform the use and impact of digital in our schools. We’ve all being doing PowerPoint for a LONG time now and at times we’ve become sick to death of them. There is a new presentation tool available, also created by Microsoft, which uses a really simple toolset for really impressive results. You can, for example, take a Microsoft Word document and drop it into Sway and it will create the sections and slides and titles that are in your draft. You can add video, slideshows, twitter feeds and a whole host of other content. The killer is that you can then share it with everyone and anyone online because Sway is free for everyone and can be viewed through any browser.